After a weekend of mostly grey skies, rain and three boys bored with cabin fever (my husband included), I was filled with relief when the skies finally cleared and the three of them set out late on Sunday afternoon for “Boy only fun”. I was happy to not be included in their little outing, as it gave me the chance to try and bring some kind of order back to the house and attempt to get organised for the upcoming week. After spending half an hour chiseling dried Weet-bix off our dining chairs and table (that stuff seriously turns to glue), I wasn’t really in the mood to go all out preparing dinner. I decided to turn to one of my favourite ‘go to’ recipes – Zucchini Slice, which I knew everyone would eat and best of all I could freeze the leftovers. I follow a basic recipe, but when it comes to adding the vegetables it’s all about what’s in our fridge. 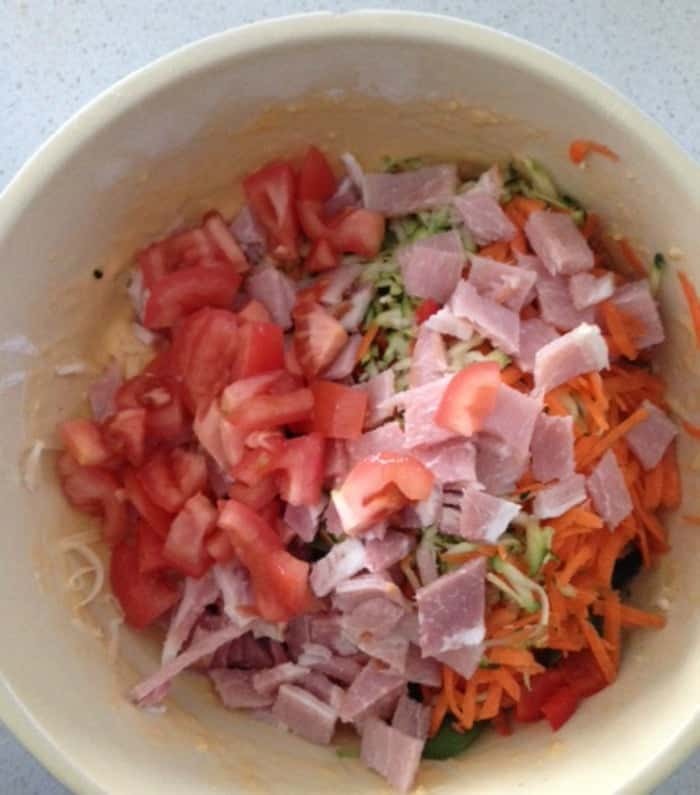 You really can’t go wrong, you can hide add as many vegetables as you like, omit the bacon/ham/prosciutto if your prefer and really get creative with your ingredients – think sun dried tomatoes, fetta, olives etc. You can eat it simply on it’s own, serve it with steamed vegetables and pasta or enjoy it with a salad and tomato relish. Best of all you can freeze the cooked slice! Preheat your oven to 190 degrees (fan forced) and line a slice tin with baking paper. Grate the zucchini, onion and carrot and set aside. Chop the capsicum, 1 of the tomatoes and bacon into small pieces. In a large mixing bowl, add the eggs and beat well. Add the oil and flour and whisk together until smooth. 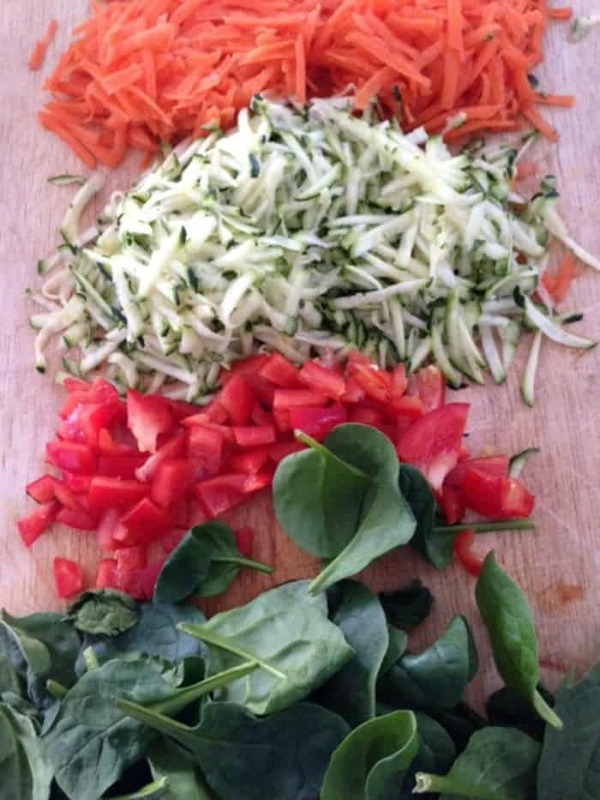 Add your chopped and grated vegetables, baby spinach leaves, 3/4 cup of grated cheese and mix together. Add salt and pepper to taste. 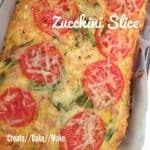 Pour into your slice tin and top with sliced tomato, pepper and the remaining 1/4 cup of grated cheese. Pop in the oven and bake for 35 - 40 minutes, or until golden brown on top and cooked through. What are your favourite ‘go to’ meals? Yum! 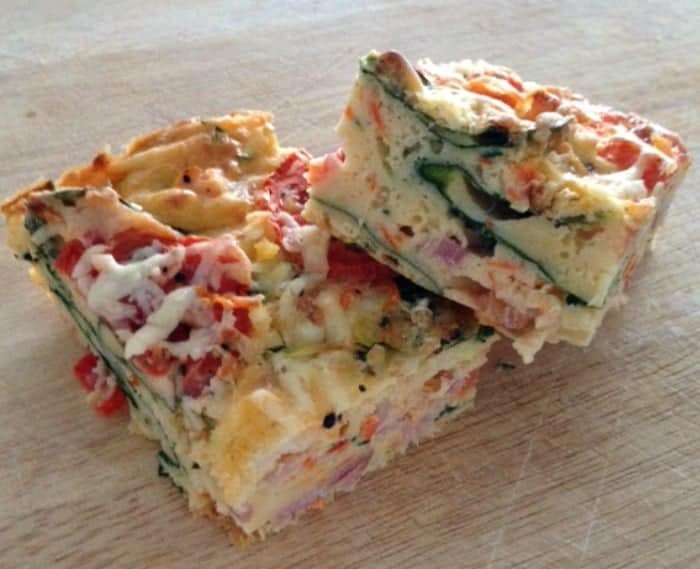 I’m going to make this zucchini slice this afternoon for the kids lunchboxes tomorrow. Thanks for the recipe. 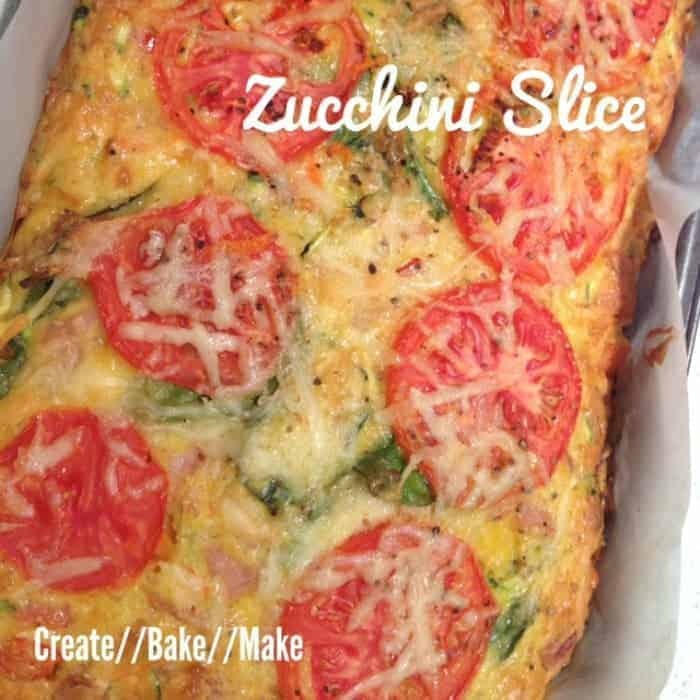 My kids used to love Zucchini slice and then all of a sudden stopped eating it! Might have to make it again and see if they are back into it. It’s such a tasty, healthy lunch box idea. I go through phases where I will totally go off something I used to really enjoy. Hopefully your kids will eat it again! Do you know I’ve baked your mum’s orange cake twice now, and we have eaten the cake within 2 days flat once baked!! I know I’m going to bake it again this week too! I’ve never made a zucchini slice only because my husband doesn’t like zucchini but I bet he’d hardly taste it in this recipe. You know I’ve never tried Zucchini slice, but I like the look of it. Will definitely have to give it a go. As for the weetbix, no kidding, a few years ago I got a sander and sanded the whole top of the table to get rid of it. (Also paint and glitter.) You could build houses out of it. I love zucchini slice, it’s so easy! I feel like I spend my life cleaning up Weetbix! I LOVE zucchini slice- and luckily for me, My Man doesn’t. All the more for me! I’ve never tried freezing it though, so thanks for the hot tip! This is a favourite in our household!! It’s a great way to get the kids to eat veggies and a great way for me to get some protein without having to worry about it tasting too eggy. Oh you’ve just got to love Weetbix residue! I think you could make a good piñata using weetbix as the glue! Love any slices you can bake then freeze the leftovers!! This one would be great for my work lunches!! Our go-to meal would be good old Spag Bol boring I know but it’s all about the kids isn’t it? Spag Bol is one of our go to recipes too – as much as the kids love it I’m a fan too 🙂 Haha, I love the idea of a weetbix piñata!! I’d love to see that! Oh that looks great…. and i hear you on just using whatever is lleft in the fidge!!! Strangely I have never tried to make zucchini slice despite loving it for years. This looks so good, will be giving a go I think. Yum! I love recipes that you can add whatever is lurking in the fridge to, and even better when you can freeze the leftovers! This looks delicious!